"For a testament is of force after men are dead: otherwise it is of no strength at all while the testator liveth." 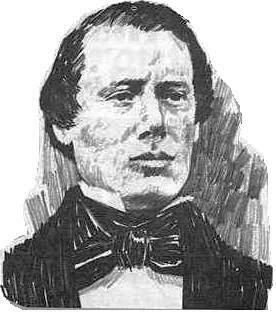 Samuel Harrison Smith was born on March 13, 1808, in Tunbridge, Vermont. He was the 4th child of Joseph Sr. and Lucy Smith, and the younger brother of the Prophet, Joseph Smith Jr. During his youth he was a devout Presbyterian until 1829. In that year, Samuel visited his brother Joseph in Harmony, Pennsylvania, while Oliver Cowdery was working as Joseph's scribe. Samuel wanted to find out more about what Joseph was doing. Joseph told him about the record and showed him some of the pages that had been transcribed. Apparently, Samuel wasn't convinced and didn't immediately believe his brother's story. After speaking with Joseph and Oliver, Samuel went to a private area to pray concerning the things his brother had told him. He later testified that he received an answer from the lord confirming all that Joseph had told him. In May of 1829, he became the third person baptized into the church. In June, he was blessed to be one of the witnesses that got to "heft" and turn through the gold pages. He was one of the six people present at the Whitmer house when the church was officially organized. He was also the first missionary called in the new and last dispensation. In 1834, he married Mary Bailey. They would have four children. Mary died January 25, 1841. He later remarried to Levira Clark, whom he would have another three children with. In June 1844, he rode horseback to Carthage to see his brothers Joseph and Hyrum, who were being held in Carthage jail. He met up with some members of the mob who refused to let him pass. He rode another trail to Carthage and by the time he made it to town he was being pursued by members of the mob. He arrived at the jail moments after Joseph and Hyrum had been shot to death. Members of the mob at the jail saw him coming with a crowd of people behind him. They didn't realize he was being chased by their own and figured it was the Nauvoo legion coming to attack so they fled, leaving the bodies of Joseph and Hyrum behind. He would later become an unofficial third victim of that mob, contracting bilious fever and died a month later on July 30. "In the spring of 1832, Elders Samuel H. Smith and Orson Hyde, of the Church of Jesus Christ of Latter-day Saints, came to our neighborhood and held a few meetings. Elder Smith read the 29th chapter of Isaiah at the first meeting and delineated the circumstances of the coming forth of the Book of Mormon, of which he said he was a witness. He knew his brother Joseph had the plates, for the Prophet had shown them to him, and he had handled them and seen the engravings thereon. His speech was more like a narrative than a sermon. Elder Hyde made a few closing remarks and appointed another meeting. At the close of the first meeting my father, as his custom was, sprung his usual question about the spiritual gifts and was quite surprised to hear Elder Smith say, "That is our doctrine, and we have those gifts in our Church."